First let's look at the word. We've got "anti" and "oxi". So does that mean antioxidants are anti oxygen? Well, not quite. The important thing to know is the difference between oxygenation and oxidation. Oxygen is good and being oxygenated is very good. Every organ in our bodies needs oxygen. But oxidation refers to the breakdown of materials by aggressive little atoms and molecules. An iron bumper on a car breaking down and turning to rust is an example of oxidation. So when you think antioxidants, think anti-oxidation. 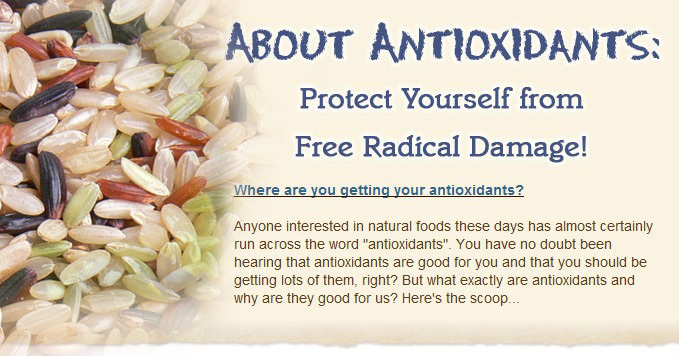 Antioxidants are compounds that help us fight against damage from oxidation. Our bodies are constantly reacting with oxygen as we breathe and as our cells create energy. But this process along with poor quality foods and pollution can create an abundance of highly reactive molecules in our system called free radicals. Free radicals are atoms or groups of atoms that are missing electrons. Free radicals bounce around looking to replace the missing electrons and cause our cells oxidative damage. They can damage proteins, cell membranes and even genes. Oxidative damage has been implicated in the cause of many diseases such as cancer and Alzheimer's and is also said to accelerate the aging process. Poor quality foods and environmental pollutions have exposed us to more free radicals than ever before. This is where antioxidants come in handy. They are rich in electrons and neutralize free radicals, stopping their oxidative damage in its tracks. Here comes the fun part. There is a wide variety of foods that are brimming with antioxidants, and they come in all different flavors, textures and colors. In fact you may notice that many antioxidant rich foods are very colorful. That is because in most cases, the color IS the antioxidant. For example the dark purple color of Vivo Rice, the bright orange of carrots and goji berries. So whether you're a rice lover, chocoholic, a berry lover, or a green food fan, you'll be able to find your favorite source of antioxidants.